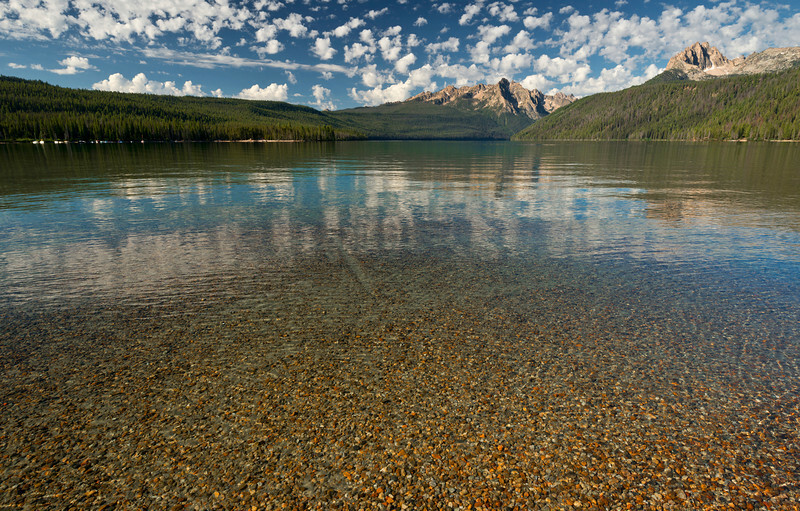 From the shallow end of Redfish Lake, small water-washed pebbles sparkle in the morning sunshine. This shallow beach reaches far into the lake before dropping into the cold blue depths. Mt. Heyburn and the Grand Mogul, at the far end of the lake, are iconic peaks of the Sawtooth National Recreation Area. Redfish Lodge, and the Redfish Visitor Center are located here, offering boat shuttles for backpackers, hotel rooms for guests, a restaurant offering up fresh trout, and an interpretive center leading day hikes and selling local artwork.